Whether it's with photos, movies or music, chances are at some point you've maxed out the space on your tablet or smartphone. 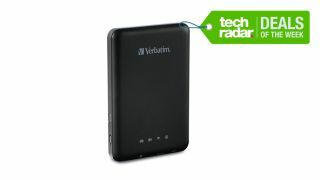 Fortunately this wireless media hub from Verbatim, currently at £34 over at Amazon, lets you plug in any of your portable USB flash drives, hard drives or SD cards, then stream that content to your tablet or smartphone. Genius! It's got a five-hour battery life so plenty of time for a couple of movies on that long journey, and up to five devices can connect at the same time so no more huddling over that one small screen. What's more it usually costs £50 but right now you can save 33%. We're always on the lookout for good value storage and on the whole a 1TB hard drive is big enough and convenient enough for most every day uses. They'll generally set you back in excess of £50 so this Toshiba 1TB Stor.E Basics Hard Drive is a steal at £45.99. And don't forget you can get unlimited movie and tv streaming with Amazon's new Prime package. Try it out free for 30 days here.